Home » Blog » The Big Picture – Forces in Siachen: Should there be a Re-Think? The Big Picture – Forces in Siachen: Should there be a Re-Think? Forces in Siachen: Should there be a Re-Think? In February 2016, an avalanche in Siachen glacier took lives of 10 soldiers of Indian army. Thousands of Indian and Pakistani soldiers have died in adverse conditions in this region. High expenditure of maintaining troops is another issue. The debate on demilitarisation of zone has time and again come up, especially when such tragedies strike. Though over a period of time, improved habitat, improved equipment and better training has reduced number of casualties related to weather and terrain, yet it still remains to be analysed if military and material investment for strategic occupation in Siachen justify loss of lives of soldiers. The 1949 Karachi agreement had demarcated the border (LoC) but when they reached the map point NJ 9842, both sides realised that beyond that point the area was not suitable for human habitation. So they gave up and said that the land from there ran northwards. The Simla agreement of 1972 did not even mention the issue. Pakistan took advantage of that ambiguity and started sending foreign expeditions since 1951 by giving passes and virtually telling the world that they owned the area. The first Indian expedition went in 1981 which is when India realised that Pakistan was already showing its presence. In 1984, under Operation Meghdoot, Indian army captured the entire Siachen glacier which forms a part of Kashmir. India gained the advantage of sitting at a higher position on a strategically important terrain just one week before Pakistan could. Siachen is part of Jammu and Kashmir which acceded to India in 1947. Occupation of Saltoro is therefore occupation of Indian Territory by the Indian Army and hence non-negotiable. The Saltoro Ridge is a crucial mountainous stretch which acts as a watershed. It overlooks the area of Gilgit–Baltistan of Pakistan Occupied Kashmir (POK) that is under dispute with Pakistan and also the illegally ceded Shaksgam valley to China. It guards the routes leading to Ladakh. India maintains cautious approach post Kargil war. There is trust deficit between both countries and thus demilitarising remains a far off option for now. Though India has established its position in 1984, Pakistan have never given up. Geography favours Pakistan in terms of access as the topography is more amenable. However, the fact that Jammu and Kashmir remains unresolved and closeness between China and Pakistan in the area is well known, India cannot give Pakistan the position of superiority in tactical sense and rather India has to debate and negotiate from the position of strength. There can be discussions and dialogues between two countries for demilitarising the area but at the same time India should not vacate from Siachen before Pakistan authenticates India’s position of Siachen glacier. 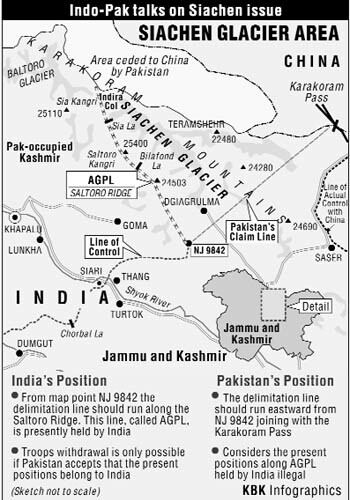 Before 1984 Siachen was not strategic as Pakistan did not attempt to stake its claim directly on an area which was left voluntarily unclaimed by both countries. Also, China had not shown the same degree of interest in the cluster. Now with ‘China-Pakistan Economic Corridor’ scheme, China is showing increased keenness in the area. The soldiers have to ultimately face the most challenging situation in rough terrains. Hence a peace deal is always sought. However, such deals logically explain their worth when the other party has sense of responsibility. Apart from Indus water treaty which benefits Pakistan, it has honoured no other treaty with India. However, during tragic incidences, both countries offer helping hands. But these initiations don’t lead to political settlement. What happens with troops on LoC is different matter than what happens on a political front. To have a political settlement, there needs to be a political understanding, a diplomacy where both countries engage each other through talks. This is not possible when efforts for peace talks are disrupted with terror strikes. Not so strategic- Indian Army’s elevated ground position on the Saltoro ridge that gives a great deal of strategic advantage is more myth than reality. Senior commanders of the Indian Army have in the past made precisely such an argument that Siachen does not have any strategic significance and it is all invention. China threat- Any perceived threat from China of military interference in areas surrounding Siachen glacier through Karakoram Range and Soltoro ridgeline is not possible as it is militarily unsustainable and also a logistical nightmare. A new enemy- More than war, weather is inducing more fatalities. Nature has become more adverse with global warming impact. The glaciers are equally effected with increased melting of snow and thus creating a greater challenge for soldiers patrolling the areas. Not just India, but Pakistan has also lost a large number of soldiers in Siachen. In 2012, 129 Pakistani soldiers died in massive avalanche. Siachen peace- A Low hanging fruit? India and Pakistan came close to signing the agreement to solve Siachen issue in 1992 but the differences about authenticating the ground positions led to breakdown of agreement. This reflects the degree of mistrust between two countries. If there has to be an agreement, both the countries have to have assurance that neither side will try to pre-empt the other in re-establishing control over the territory. Initially the issue was discussed at DGMO level in 1989-90 and has also been discussed at part of CBMs in foreign secretary level composite dialogue. However, with Pakistan’s frequent examples of breaking trusts, India will no longer trade its national security on basis of trust. Hence, Siachen is still not the low hanging fruit on the basis of which India and Pakistan can broker peace. Conclusion- is a peaceful solution possible? Strategic territories are critical for national security and hence the armed forces have the duty to protect it. Siachen is considered strategically important and thus India has to own and protect it. However, efforts should be invested in further identifying the out of box solutions to assess if it is safe to make the area free from military interference. Siachen Peace Park- During former PM Manmohan Singh’s visit to Siachen basecamp in 2005, he suggested of turning entire Siachen region into a peace park. Taking the idea further, it can be turned into an international destination for glacial research and other scientific experiments. This will also act as deterrent against any potential Pakistani attempts at occupying the territory, it could also check the Chinese activities in the greater Karakoram region. Identifying the current position: Bothe countries should authenticate the current positions at the glacier and make way for further dialogues. 1992 understanding can be again resorted to. Critically examine the factors leading to and probable impact of demilitarisation of Siachen zone.